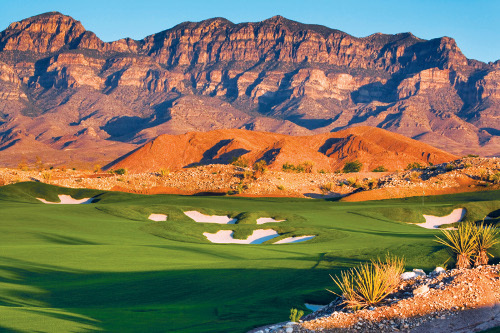 Coyote Springs is the first golf course in a planned series of Jack Nicklaus-designed courses that will flow throughout the Coyote Springs community. The course plays to a par 72 and ranges from 5,349 yards from the forward tees to 7,471 yards from the championship tees. Eleven lakes come into play on the golf course many consider to be one of Nicklaus’ finest desert creations. Coyote Springs has one of the largest and most diverse practice facilities in the world. The current practice facility measures 19 acres and features more than 100,000 square-feet of tee area, 13 target greens for a variety of club selections, as well as a short game green for pitching, chipping and bunker practice. The practice green measures 10,000 square-feet and offers a multitude of hole locations to prepare you for your golf experience.